PE0284. THE LILAC DOMINO (Charles Cuvillier), recorded 1918, w.Howard Carr Cond. 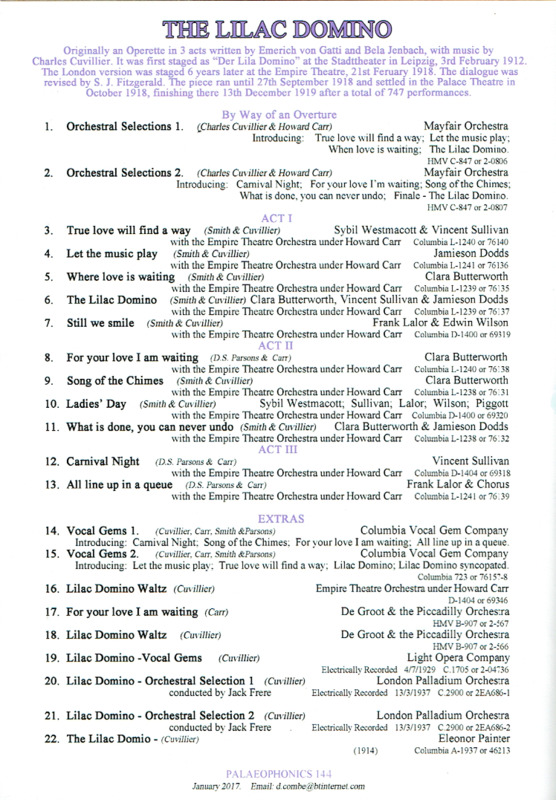 Empire Theatre Ensemble; Sybil Westmacott, Jamieson Dodds, Clara Butterworth, Vincent Sullivan, Frank Lalor, Edwin Wilson & Stuart Pigott; additional material by Eleanor Painter (star of the New York Production), Columbia Vocal Gem Company, London Palladium Orchestra, De Groot & the Piccadilly Orchestra, etc. (England) Palaeophonics 144, w.Elaborate 'The Play' 14pp. Brochure replete with numerous photos of the Empire Theatre 1918 production & biographies. Excellently transferred from the legendary Acoustic 78rpm HMV rarities. "DER LILA DOMINO (The Lilac Domino) is an operetta in three acts by Charles Cuvillier. The original German libretto is by Emmerich von Gatti and Béla Jenbach, about a gambling count who falls in love at a masquerade ball with a noblewoman wearing a lilac domino mask. The operetta achieved far greater popularity in Britain and America than it did in Germany or France. DER LILA DOMINO was first performed in Leipzig, Germany, on 3 February, 1912, where it was a failure. Although produced with success in the U.S. (1914) and outstanding success in the UK (1918), the work was not seen in France until 1947, when a production was mounted at Mulhouse, with a cast including Willy Clément. 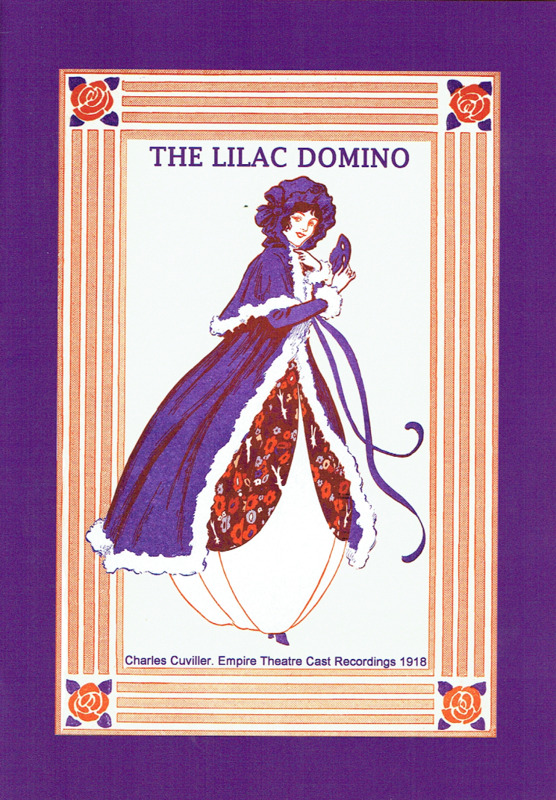 Entitled THE LILAC DOMINO, with an English libretto by Harry B. Smith, lyrics by Robert B. Smith, and additional songs by Howard Carr and Donovan Parsons, it opened on Broadway at the 44th Street Theatre on 28 October, 1914, produced by Andreas Dippel. It received favourable notices and ran for 109 performances, starring Eleanor Painter and the English baritone Wilfrid Douthitt, followed by a North American tour. In the U.S. and UK versions, the setting was changed from Nice, France to Palm Beach, Florida. A new version was presented in London, with revised dialogue by S. J. Adair Fitzgerald, opening at the Empire Theatre on 21 February, 1918, and running there until 27 September, 1919. After a brief break, the production transferred to the Palace Theatre in October 1919. The piece ran for a total of 747 performances, closing on 13 December, 1919, an extraordinarily long run at that time. The London cast starred Clara Butterworth and Jamieson Dodds. It became the third of London's great World War I hits after CHU CHIN CHOW (1916) and THE MAID OF THE MOUNTAINS (1917). Some of its success in London was due to interpolated numbers by the Empire Theatre's musical director, Howard Carr, a nephew of the composer Howard Talbot. One newspaper review commented, 'The music throughout is beautiful and even if the whole company were to dispense with costumes and sit in a ring like Christy Minstrels, THE LILAC DOMINO would be a success'. To which the humorous magazine PUNCH responded, 'We can well believe it'. THE LILAC DOMINO remained in the British musical theatre repertoire until after World War II, also touring in Britain, Australia and elsewhere. Jamieson Dodds, from the London cast, led the first Australian tour in 1920." "[THE LILAC DOMINO's] London production [featured] Clara Butterworth and Jamieson Dodds [as] the young lovers. It was a decided novelty for the Empire, a house generally associated with variety and revue, and this operetta attraction had an opening matinée instead of an opening night, thanks to air raids." "Stuart Pigott, who played the role of the heroine's millionaire father, died suddenly in his dressing room, during the run, having not missed a single performance of the first 565."